We can make a scene for any event you can imagine! School events, book events, store openings and much, much more! We return to River Cottage for another amazing Spring Fair. We can manage events public and private including weddings, birthdays and fetes. Thrilled to be returning to TGLE 2019! Longer and even more amazing! A change of Festival and a new Scene Machine Experience! Kicking the year off with the fabulous Take PArt 10 Festival at Venue Cymru 2019. An exciting mix of entertainment and education with creatives from Film, Theatre and Literature. Make A Scene in the New Year! Early news is that we are confirmed to return to The Goodlife Experience for 2018! Always a unique experience for all the family including your dog! Already making big plans for this one! After 4 successful school visits with history lessons and modelling workshops we will bring the exhibition at Willsbridge Mill to a big finish with scene celebrating this big anniversary. August sees us celebrate the Summer with a Summer Scene in Bruton! Lets Make art with Lets Make Art UK at Ashton Court! 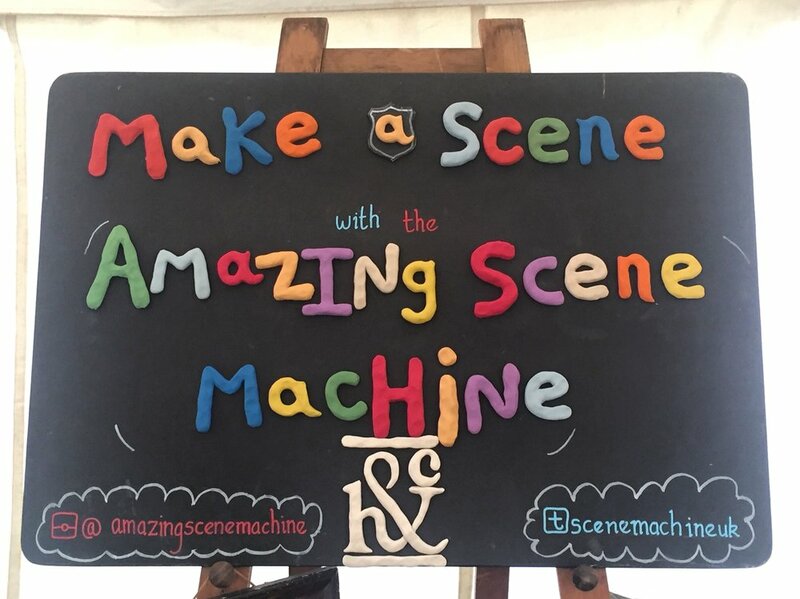 Amazing Scene Machine joins Lets Make Art Uk at the amazing venue that is Ashton Court! Come and make a scene with us and check out the host of amazing events that Lets make art put on in and around Bristol! Getting animated about online safety in the Kula Den at the Boadmasters Festival. 3 days of fun in the sun! drop in for our 1 hour sessions to make your mark and help spread an important message. We are thrilled to announce that we will be at 'Gather' at the fabulous Fforest in 2018! An experience like no other! spend a week on the Fforest set in uniques accommodation or camping in stunning countryside very close to Cardigan. Lots of things to see, do and eat and drink. We are in love with this place and the team that run it. We are making a scene in an outdoor venue and trying out some exciting new ideas in the 2nd week of activities. Join us for an incredible week! Handmade is always best and all of our scenes are entirely handmade. We join Kirsty Allsopp and a host of amazing crafts people in celebrating arts and crafts of all kinds. Stunning setting for an Amazing Scene! We join Kirsty Allsopp at Bowood House for The Amazing Handmade Fair 2019. We have appeared at several of Kirsty’s shows previously but this is the first time the show has taken place at Bowood House. Very much looking forward to seeing you all there! ASM is all about coming together and teamwork to create our amazing scenes. This evening is about togetherness and everyone making a scene! ASM is more excited than ever to be going River Cottage and think this will be a really spectacular scene capturing all of the incredible things Hugh and the team are famous for! Pig Sty, Gloucester Road Bristol Amazing Pig based Fun! What better way to celebrate the opening of a pork filled restaurant than with an Amazing Scene packed full of Jolly Hogs! We have teamed up with 'The jolly Hog' company for the opening of their brand new restaurant on Gloucester Road Bristol. King Kong! King Of the Apes! T Rex! King of The Dinosaurs! See who will win in Apes Vs Dinosaurs! Oh, and watch they amazing piece of Cinema History. We are excited to be travelling to Sussex and the beautiful village of Beccles! Join us at Beccles Public Hall and make a scene! Valentines Day and spreading the love! 2 workshops to make a lovely scene with the lovely folks at FMLY store in Bruton. Come and share the love! Amazing Scene Machine adds to the Festive cheer at Willsbridge Mill! A lovely old mill semi hidden in the woods close to Longwell Green. Santa breakfast and seasonal foods and activities will be held all weekend and pick up your Christmas tree at the same time! Very excited to be joining Frome Independent Market on Sunday 3rd December! Surrounded by incredible makers and purveyors of beautiful objects we will be capturing the magic of the Christmas market in our unique way. Come and watch a beautiful stop motion film and make an animated fruit and veg animation! The festival season ends in style once again with a return to The Good Life Experience 15th to 17th September 2017. A festival like no other and led by an incredible team to make a brilliant mix of food, art, craft and of course fabulous music! Join us in our happy place! What a way to spend the BankHoliday Weekend! An incredible castle setting and theme will make for an exciting few days! A monumental site requires a monumental scene so we are going bi with this one to capture the magic of this incredible event over the Easter holiday! We're closing out the Festival Season with a MASSIVE scene at the Good Life Experience at the Hawarden Estate in Flintshire. You can find us at The Green in the Pleasance Courtyard making our biggest scene yet and running Model Making Workshops.